The Paleo Plan – Good For You, Or Too Good To Be True? If you have been following nutrition trends over the past five years, good or bad, then I’m sure you’ve heard about the Paleo Plan, also called the Primal Plan or Caveman Diet. The Paleo Nutrition Plan is based upon everyday, modern foods that mimic the food groups of our pre-agricultural, hunter-gatherer ancestors. These foods include fresh meats (preferably grass-produced or free-ranging beef, pork, lamb, poultry, and game meat, if you can get it), fish, seafood, fresh fruits, vegetables, seeds, nuts, and healthful oils (olive, coconut, avocado, macadamia, walnut and flaxseed). It is said that dairy products, cereal grains, legumes, refined sugars and processed foods were not part of our ancestral menu and are therefore excluded. I can’t help but be curious how they know that this is exactly what people ate as far back as 2.6 million years ago, but that’s beside the point I imagine. I have been very curious about this nutritional way of life (true devotes will tell you it is NOT a “diet”), so have been doing a lot of reading on the internet and was shocked to see how many websites and recipe blogs are based on the Paleo plan. (See list of some below) Many folks who are blogging about it began following this plan because they had a myriad of health issues from autoimmune diseases, diabetes, or dietary based diseases and/or allergies, and swear this plan either cured their health issues or made them tolerable without medications. Whether I believe that a diet such as this one can perform this kind of magic or if it is simply that these folks are now eliminating all processed foods from their diets that include the many artificial sweeteners and preservatives they might be sensitive to, is still up in the air for me. Would simply following a healthy nutrition plan that included organic fresh foods without the inclusion of any of the unhealthy processed ones be just as helpful? Not being an expert, I can only wonder. Loren Cordain, PHD, is considered to be the founder of the Paleo movement and an expert on Paleolithic diets states that by following this Paleo plan you can control obesity, diabetes, help prevent cancer and many autoimmune diseases. He states that this is accomplished by following seven fundamental characteristics of the hunter-gathers diet. I personally have been having increasing dietary issues over the past five years, and my allergist who treated me for respiratory and skin allergies wanted me to go on a food elimination diet a few years back to see what I might be sensitive to. I honestly tried to follow this strict plan a couple of times but just never followed through with it. After reading so many positive responses to the Paleo plan (and since it does eliminate such dietary triggers as whole grains and dairy products) I’ve decided to try it for a month. Why a month? Everything I read states that many people may feel ill or shaky the first week as your body learns to burn fat instead of easily digestible carbs, and it can take up to two weeks to start to see the benefits. It is suggested that if you try this dietary plan that you stick with it for at least 30 days to get any real results. I am going to give it a try and will post my weekly updates on how I’m fairing here on Recipe Rebuild. I do love the fact that I am allowed, even encouraged, to eat lots of fruits and vegetables on this plan compared to many of the trendy low carb diets which will certainly make this an easier plan for me to follow, though it is recommended that you limit dried fruits and starchy vegetables. Will I stick to it after 30 days? I honestly cannot imagine that I will at this point because I live 6 months in Italy, the land of pasta and pizza, and truly love whole grains. It may however make me a little more conscious about what I’m eating in regard to preservatives, and choosing organic meats and produce. Although I do eat what I would call a healthy Mediterranean diet, I am sure I have room to improve. In am hoping that by following this plan strictly for 30 days, and then slowly introducing some foods back into my diet that I may discover what is causing my dietary issues so that I can eliminate those foods completely from my diet. Who knows, maybe after a month I’ll feel so amazing that I too may jump on the Paleo bandwagon! I have been following the plan strictly for 3 days so far, and as of now I’m feeling just fine though I had to give up my morning coffee as it made me feel too shaky. This is not the worst thing to happen as I probably drank too much to begin with and I’m learning to appreciate herbal tea. Finding thousands of recipes for this plan online will certainly make following it for 4 weeks much easier. Stay tuned for my weekly updates! Disclosure: I spoke to my daughter Christy who is the RD in the family (and my blog partner here on Recipe Rebuild) and she has some concerns about this nutritional plan, including that by eliminating whole grains folks will not be getting enough fiber which may cause issues in future years. We did agree however that since this Paleo plan seems to be very popular now, and is in fact increasing in popularity, that it would be worthwhile for me to post about my experience on Recipe Rebuild. What can you eat on the Paleo Plan? What can’t you eat on the Paleo Plan? 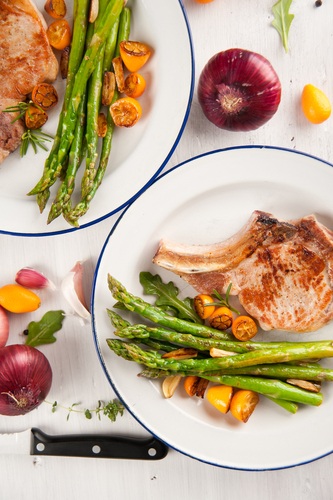 Want to learn more about the Paleo Plan? Here are a few good links I found helpful……. My Personal Paleo Plan Update: I finished week one without too many issues. I found the diet plan easy to follow with lots of choices so I was quite satisfied. I did find I was shaky and felt a little weak upon waking every morning and wasn’t able to drink coffee. Week two I didn’t do as well as I found unless I ate every couple of hours I began to feel weak and shaky throughout the day, I loat my appetite, and I began to have some digestive issues which frustrated me as it was the very reason I wanted to try this plan. By the end of the week I either got food poisoning or a killer dose of the flu and was in bed for almost 4 days and unable to eat much of anything. Not sure if the Paleo plan had anything to do with my illness or not (weakened immune system? ), but I decided to give it up for now and simply eat a healthy diet until I am 100%. I’ll decide in the future whether I want to try the Paleo Plan again. It will be interesting to see what your experience is. One of my big questions about this, other than what your daughter had questions about above, is why root vegetables, legumes, and grains are not included. I’m sure that plants have evolved over that period of time, but when one looks at the diets of North American Indians or South American Indians they included starchy things like cattail roots, wild rice, skunk cabbage roots, and, yes, beans. Anyway, whether going this route or just in general, I hope you find some answers for your dietary problems. And enjoy your time in Italy! Root vegetables are higher in startch apparently. There is a whole science behind why they chose the foods they did.